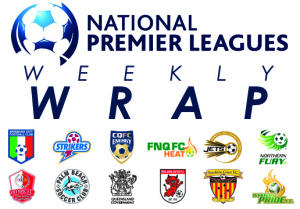 Two more clubs secured berths in the inaugural NPL Queensland finals series, while there's a new leader in the race for the golden boot. Review all the weekend's action in the Round 21 Weekly Wrap. IPSWICH | Forwards Royce Brownlie and Peter Drager traded braces on Saturday night as Western Pride and Moreton Bay Jets played out an entertaining 2-2 draw at North Ipswich Reserve. Drager’s first half haul handed the hosts a two goal advantage at the break, however Brownlie popped up twice in the second half for the visitors to force a share of the points. Pride took the lead inside ten minutes when Drager picked off defender Michael McEvoy’s errant pass, the lanky forward holding off a defender before styling a low finish past the advancing Marko Radanovic in goal. Just after the half hour Drager struck again from a through ball, showing a turn of speed then rounding Radanovic before finishing into an empty net for his 14th goal of the campaign. Jets returned a different side in the second half and forced Pride gloveman Steve Purdy into a number of saves before Brownlie headed home from a floated corner kick on 67 minutes to half the deficit. The experienced striker scored his second nine minutes later when he fired in a first time strike from the top of the box courtesy of Moses Joseph’s cut back pass. Both sides continued to threaten in the final ten minutes, but telling interventions from Radanovic and Purdy ensured the scores remained level at the close. 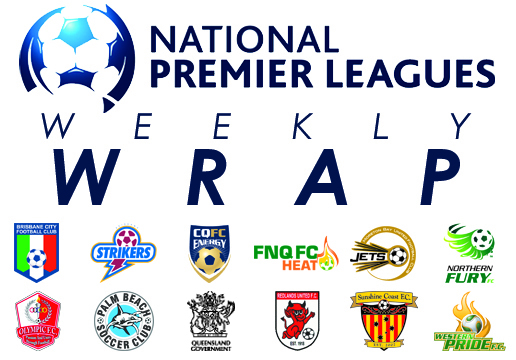 The drawn result lifts Moreton Bay Jets into sixth-place on the NPL Queensland table while Western Pride remain in eighth. TOWNSVILLE | A hat-trick from star striker Antonio Murray returned Brisbane City to winning ways on Sunday afternoon following a hard-fought 4-2 win over Northern Fury at Townsville Sports Reserve. Murray struck twice in the final quarter hour to close out the visitors 14th win of the season and secure City a spot in the end of season NPL Queensland finals. Murray opened the scoring on 16 minutes when he turned in a left footed strike from 15 yards. However, the teams entered half time level after Newie Cobbo netted his first goal of the season on 34 minutes. Ten minutes after the restart the sides exchanged counter punches – Alistair Pase firing City ahead with a curled shot from the edge of the penalty box, only to see Michael Eisenhut finish off a neat give-and-go a minute later to restore parity. The arm wrestle continued before Murray secured his hat-trick late in the match – heading home from close range with 14 minutes remaining before sealing the points in the final minutes with a confident one-on-one finish. Murray’s three goal haul returns him to the top of NPL Queensland goal scorers chart with 26 goals for the campaign. City sit in second-place on the table fourth with two regular season fixtures remaining. SUNSHINE COAST | A second half brace to Alex Barlow secured Sunshine Coast Fire a spot in the NPL Queensland finals following a 2-0 win over Brisbane Strikers at Sunshine Coast Stadium on Sunday afternoon. Barlow’s two dead-ball strikes – the first from a free-kick, the second a penalty – proved decisive in a match that never truly found its rhythm. Following a stuttering and scoreless opening half, Barlow struck his first barely four minute after the restart when he curled a 30-yard free kick past Strikers goalkeeper David Chambers at the far post. Seven minutes later, Barlow converted from the penalty spot after Alex Henderson brought down Fire winger Nico Bechar with a clumsy challenge. The goal Barlow’s third of the season. The win assures Fire a position in the end of season finals, however fourth-placed Strikers still need four points from their final three fixtures to be guaranteed of finals football. GOLD COAST | Midfielder Chris Lucas scored his first hat-trick of the NPL Queensland season, leading Palm Beach Sharks to a 3-2 win over FNQ FC Heat at Mallawa Complex on Sunday afternoon. The win ended a five-match losing streak for the Sharks, who have struggled for consistency in the back half of their inaugural NPL Queensland campaign. Lucas netted his first two goals in a ninety second spell on the half hour – finishing off two swift counter attacks from the hosts that caught out Heat’s largely inexperienced backline. Lucas rounded out his haul, and extended the lead to three goals, shortly after the restart when he latched on to a lobbed through-ball and slotted his shot to the right of the goalkeeper. The visitors added Jamie Carroll to the fray with instant results, the substitute forward delivering a corner for Charles Beverley to head home strongly before playing a cross from open play for Cameron Morrison to reduce the lead to a single goal. Heat almost stole a share of the points in time added on when they struck the crossbar, but Sharks held despite the pressure to record their first win since June. ROCKHAMPTON | CQFC Energy scored three goals in the final ten minutes to see off Queensland Academy of Sport 3-0 on Sunday afternoon at Rugby Park. The hard fought bottom of the table clash proved a nail biter before the hosts broke free in the final minutes courtesy of goals to Kevin Fraser, Braedyn Crowley and Jordan Miller. Brothers Kevin and James Fraser combined to break the deadlock on 84 minutes – James controlling a lofted pass from Jarod Lancaster before teeing up his brother for a solid six yard strike. Braedyn Crowley doubled the advantage in the final minute of regulation time with a thundering close range strike that finished off a neat set of short passes that fashioned space amidst a crowded penalty area. However, Jordan Miller iced the performance in time added on with his fifth goal of the campaign – the youngster dusting a defender with a classy flick then shaking another before slotting home a cool finish. The result sees the Academy unable to avoid the inaugural NPL Queensland wooden spoon in their final fixture next weekend – the youngsters recording just two wins and two draws from 21 games played this season. BRISBANE | Redlands United’s NPL Queensland finals hopes hang by a thread after the fifth-placed club fell 2-1 to league leaders Olympic FC on Sunday afternoon at Goodwin Park. Jai Ingham’s second-half strike proved decisive for the hosts after Redland’s Nick Robinson cancelled out Nick Efstathis’ first half opener for Olympic. Olympic opened accounts on 16 minutes following a goal mouth scramble – the ball falling invitingly for Efstathis, who smashed it into the net from close range. The hosts held the single goal margin until the half time break, however nine minutes after the restart Nick Robinson levelled terms – the former Brisbane Striker benefitting from Reuben Way’s header to slot his shot in at the back post. The two attack-minded sides exchanged blows without success until Ingham netted the winner with 19 minutes remaining. The right winger using his trademark pace to nip in behind the Redland’s line before lifting his shot over stranded Redlands reserve goalkeeper Bradley Stout. The loss leaves Redlands in fifth place on the NPL Queensland table and three points adrift of Strikers in the hunt for the fourth. Strikers also hold a game in hand over their finals rivals, further complicating the Devils task of a top four finish.